Rotherham United left it late to get all three points in their first home game of the season this afternoon against an Ipswich Town side that pushed them all the way. Before the game the big flag went around the stadium and there was a minutes applause for former Chairman Syd Wood and Honorary Life President Barry ‘Chuckle’ Elliott who sadly passed away this week. The visitors were quick out of the blocks when Zak Vyner had to be on his toes to prevent Gwion Edwards from opening the scoring. Minutes later Joe Newell had to do the self-same thing again from Edwards before Richard Wood headed away a good ball from former Millers loanee Grant Ward. The first Millers real forage upfront came around the twenty minute mark when some good work from Kyle Vassell was heading towards Newell but a blue shirt got in the way. At the other end Marek Rodak did well to get down to smother at the feet of Ellis Harrison followed by Jon Nolan appealing for a penalty after he fell under a challenge from Semi Ajayi. Some good work from Jon Taylor on the wing found Will Vaulks who passed to Matty Palmer but Town ‘keeper Bartosz Bialkowski was alert to the danger and claimed the ball. IN the final ten minute of the half Vassell pinched possession and finding Taylor the winger set-off at pace but again Bialkowski got to the ball first. The first yellow of the afternoon went to Palmer after he tripped Ward up. In the last minute Jonas Knudsen, who had far too much room all game, got the better of Vyner and brought off a smart save from Rodak. The Millers came out better for the second half and were soon awarded with a free-kick after Michael Smith was fouled. Jon Taylor took the set-piece but Ipswich get it away and only a good tackle from Zak Vyner stopped Grant Ward from sending a good ball up field. Town ‘keeper Bartosz Bialkowski got down well to a shot from Kyle Vassell followed a minute later by a Smith shot that went just wide. Jon Nolan saw two shots go wide, the second possibly the better, which missed everyone, including Rodak to skim across goal and out for a goal kick. Joe Newell was replaced by Ryan Williams on the sixty-second minute. Ipswich were putting a bit of pressure on the Millers and after a number of corners referee David Webb blew for a foul. Town’s first substitution saw Kayden Jackson replace Ellis Harrison while the Millers brought on Anthony Forde for Jon Taylor. Semi Ajayi and Vassell both saw shots cleared before the visitors got a free-kick some twenty-five yards out, which saw Will Vaulks yellow carded for a foul on Jackson, which Gwion Edwards took only to see Rodak make a brilliant save to deny him. Grant Ward got applause from both sets of supporters when he was replaced by Tayo Edun on seventy-seven minutes and Edwards was replaced a few minutes later by Jordan Roberts whose first thing was to run into the box and fall over and appeal for a penalty – which he didn’t get or deserve. With five minutes to go Bialkowski brought off a good save from Smith and moments later Forde tried his luck from distance which the Ipswich ‘keeper saved at the second attempt. In the final minute of the game Aristote Nsiala bundled Ryan Williams to the ground at the byline and Forde took the resulting free-kick which wasn’t cleared by the Town defence and fell to Smith who hit the ball into the corner of the net giving the Millers all three points and sending eight thousand Rotherham fans home with smiles on their faces. 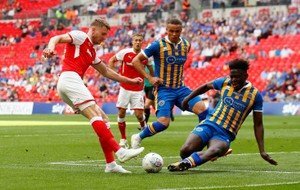 Rotherham looked a little jittery to me at the start of the game but got better as it went on taking the chance at the end of the game and getting their first win of the new season. Well, you were pretty lucky to win. The article doesn’t mention our 12 corners or the other of the two clear penalties we didn’t get. But in the end, you put the ball in the net, and we didn’t. Rotherham is a great little club, maintaining its identity surrounded by its bigger neighbours. Good luck to you. I hope you stay up, as long as its not at our expense. Thanks for those words, Steve. No, we didn’t deserve the three points. I’ve sort of mentioned that in the stats article along with the corners etc. I thought both sides had shouts for a penalty each but both would have been harsh on the opposition. And you’ve got a good little manager in Hursty.